“Days Of Future Past” Rumored To Be Next X-MEN Movie Storyline | Birth.Movies.Death. Grain of salt time: is Fox finally bringing one of the X-Men's most famous stories to the screen? Days of Future Past is one of the most famous X-Men stories for a couple of reasons. One is that it's pretty good and well done, thanks to Chris Claremont and John Byrne, who were at the time making arguably the best X-Men comics ever. But the most important reason is probably that comic fans love seeing characters die, and the story is filled with the deaths of major characters - including Wolverine being vaporized down to his adamantium skeleton. Of course all of the deaths take place in an alternate future, so fans get the thrill of the kill without having to lose their favorite characters. 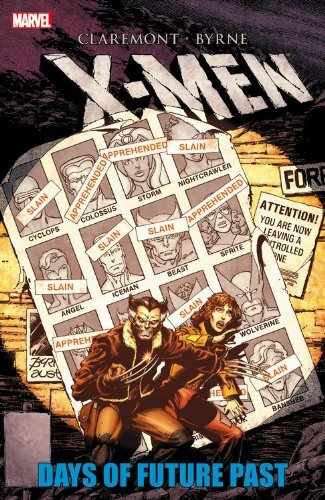 Days of Future Past really kickstarted a small wave of stories aimed at simply killing off characters in the future; eventually Marvel would publish "The End" books that brought beloved characters to their deaths. Fans have always kind of wanted a Days of Future Past adaptation in the movies, and if Ain't It Cool News' rumor is correct, that's what they'll be getting in the X-Men: First Class sequel. According to the site Fox has registered Days of Future Past as a title with the MPAA; while that's not a straight up guarantee, it does indicate that the studio is looking at that story. And it could explain why the film's title wasn't announced last week when the release date was revealed. Some people think this is a way of combining the old X-franchise with the new, by having the characters from First Class meet the older versions of the X-Men from the first three movies. I doubt that. I suspect that this will be a way of subtly removing the First Class franchise from the old continuity by casting different actors in the roles of future X-Men. Of course I'm not even convinced this rumor is true, but it's an interesting thought. It's about time that Fox went big with one of these movies, and a film largely set in a dystopian future where giant robots hunt and kill the most famous mutant characters would be appropriately big for a post-Avengers world.